Summarize: It is well known that neutrinos have mass. But quantum field theories cannot demonstrate mathematically they have a mass bigger than zero. I think it could be demonstrated that neutrinos have positive mass working with a non conventional atomic model of two entangled – I use the term “entanglement” in the sense of physical intersection – fields that vary periodically. I guess that there is some kind of link between the solution of this problem and the Hodge Conjecture. I attached a picture at the end for easier understanding. I think that it would be possible to demonstrate that neutrinos have positive mass if we consider two entangled (physically intersected) fields that vary (expand and contract) periodically. The atomic model that I am going to explain is non conventional. These two fields create in their mutual intersection four new fields that are the subatomic particles of the crated “atomic nucleus”. Here there are six dimensions, I consider each field as a dimension, but it could be possible to entangle four fields around a central field creating 21 dimensions. The two entangled fields are gravitational; the four created fields are electromagnetic. The two entangled gravitational fields can vary with the same or opposite phase. When they vary with opposite phases, when one contracts the other one expands, the created subatomic particles/fields are fermions ruled by the Pauli exclusion principle. When they vary with the same phase, expanding or contracting at the same time, the created subatomic particles/fields are bosons. When it comes to fermions, the created neutron field is the virtual antiparticle of the proton field, and the neutrino field is the virtual antiparticle of the antineutrino filed. By virtual antiparticle I mean that they are fields that exit at different, successive, times, they have the same volume and density, and mirror symmetry; they are different fields placed at opposite sides. Because they are different fields I consider them as Dirac antiparticles. Electron is the virtual antiparticle of positron; they exist in different times at opposite places showing mirror symmetry but they are not different fields, they are the same fields that move toward the left side (electron) or the right one (positron); I consider them as Majorana antiparticle. When the left entangled gravitational field contracts and the right expands, they create a neutron (N-) and an antineutrino (Ve+). Later, when the left gravitational field expands and the right contracts, they create a neutrino (Ve-) and a proton (P+). Positive and negative are signs that express opposition. I use them with the only purpose of signalling that electron, neutron and neutrino fields are located at the left or “negative” side of a central symmetry, by opposition to the “positive” side occupied by positron, antineutrino and proton. From my point of view electromagnetic charges are not properties of matter; they are a consequence of spatial displacements; fields moving right to left (in the case negative “charges”, like the electron field) or left to right (positive charges like the positron field). 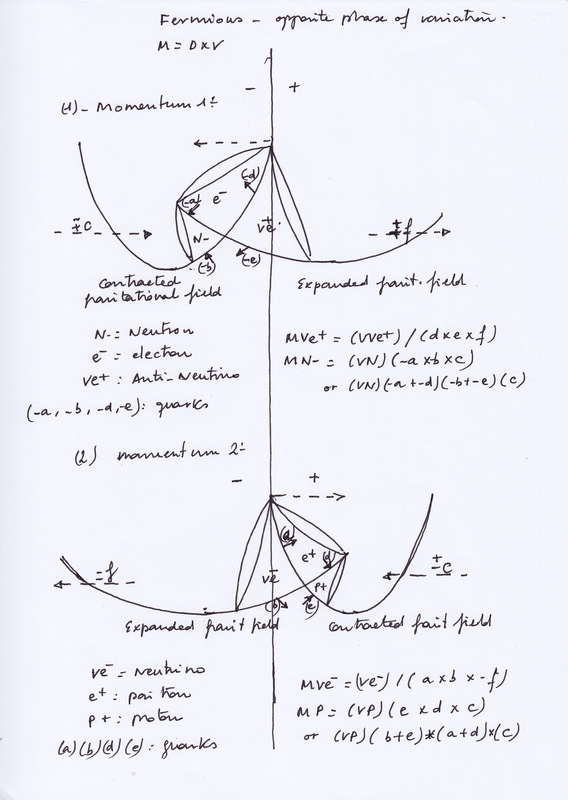 The electron field moves toward the left side not because any force of attraction but because of the contraction of the left entangled gravitational field and the expansion of the right; it moves toward the right side, becoming a positron, because of the contraction of the right entangled gravitational field and the expansion of the left. I think it is necessary to geometrize electromagnetism. And the way for it is, in my opinion, the entanglement of at least two gravitational fields that vary periodically. It is currently assumed that gravity does not have a meaningful role at atomic level. I think it is a wrong assumption. I think Gravity is a force, but not a force of attraction, it is a force of pressure that creates the gravitational curvature that varies periodically. But a force of pressure of what if we accept that universe is empty from Michelson and Morley’s experiment. Well today it is accepted that the vacuum is full of a Higgs field that vibrates. Moreover, it is known the existence of galactic and intergalactic dust and intergalactic medium. It could be thought that our galaxy turns on itself and the galactic dust is a moving flux that pressures the matter that founds, interacting with it. Anything that avoid name the current scientific anathema that has became the traditional aether would be right. The Aether mentioned by Plato in the Timeo was a moving aether, a kind of crystalline air that constantly moved. The quality of the air is to move. The Aristotelian aether that lasted until the early 20st century was a static aether. Aristotle stripped the motion to his aether when considering as the quintessence of all elements. I think that a moving galactic dust could be consider the gravitational flux of pressure that gives life and vivify the matter that if founds like the ancient aether of philosophers. At atomic level the influence of that force of pressure would be represented by the Planck constant. Planck constant is currently used in most of the quantum mechanic equations but nobody knows what it is. Neutron (which later will became a neutrino) and proton (which later will became a anti-neutrino) have identical volumes. Neutrino and proton (or neutron and antineutrino in another time) have inversely proportional volumes. Mass is density and volume. When the neutron field is created it has a lower volume but a higher density because of the forces of pressure produced on it mass by the internal face of the right side of the left entangled gravitational field that contracts, moving inward, from right to left, and the external left side of the right entangled gravitational field that expands, moving outward, from right to left too. But those mentioned gravitational sides that compress the volume of the neutron field are in fact the walls that form the neutron 3D volume/field itself. Subatomic particles do not have any entity by themselves. They are the walls of the entangled gravitational fields. At the same time but opposite side of the left neutron, at the right side – I continue speaking about fermions – it will occur the contrary, the antineutrino field will experience a decompression produced by the displacement of the right side of the left entangled gravitational field that contracts, moving inward from right to left, and by the left side of the right entangled gravitational field that expands moving outward. While the neutron field has lower volume and a higher density, the antineutrino field has a higher volume but a lower density. But although the neutron and antineutrino masses (or the neutrino and proton masses in the next time) have an inversely proportional volume, their density does not have the same proportionality. Because the neutron field receives indeed the pushing force of the left side of the left entangled gravitational field that contracts, moving inward, from left to right. And the antineutrino field experiences an extra decompression because of the displacement of the right side of the right entangled gravitational field that expands, moving outward from left to right. At the left side, the neutron field is enclosed by these three forces of pressure that form its mass; two forces that come from the right side, and a force that comes from the left side. When later the neutron field transforms into neutrino, (or when the proton transforms in antineutrino), a mass loss occurs. The mass that losses the neutron when it is transformed into neutrino is acquired at the opposite place by the proton when the antineutrino transforms therein. The same occurs with the kinetic energy that exists inside of those fields. Inside the neutron there is an increasing orbital motion caused by the contraction (the reduction) of the previous neutrino’s volume. This kinetic orbital energy inside neutron decreases when it transforms later into neutrino again. The lack of neutrino energy will be found at the opposite place in the energy that the proton gains when the antineutrino transforms into it. Mass does not transform into energy. They are not interchangeable. There are a conservation of mass principle and conservation of energy principle, and both work at mirror spatial level. It looks that when it comes to the atomic realm, mainstream physics is mistaken mass and energy. And maybe mass and density too. With respect to the Hodge conjecture, I guess that it is closely related with the atomic model that I have explained. Because the 3D subatomic volumes are formed by the 2D faces or walls of the 3D entangled gravitational fields that vary periodically. And each one of those entangled gravitational fields exists in the intersection of at least two bigger entangled gravitational fields that vary periodically too. And so on in an infinite big way. The same could be said inside of each of those created subatomic particles, if we look on the perspective of the infinitely small. The subatomic 3D particles are created by 2D spaces that move periodically, and the whole structure is a non commutative space. In an algebraic representation it would be necessary to distinguish between two imaginary dimensions that multiply creating a real one – in the case neutron or proton – or a real dimension that is divided creating two imaginary ones – in the case of neutrino or antineutrino. What axis/dimension are real and what imaginary depends on the perspective of the observer. All are at the same time real and mirror reflected.